After spending the summer on the banks of Chew Valley Lake, Marshall, the Gromit sculpture I painted for this summer’s art trail, went up for auction on Wednesday 3 October at the stunning British Aerospace Concorde Museum in Filton, Bristol. A truly fabulous night was had by all and Marshall was eventually sold off to the highest bidder when the auctioneer’s hammer finally came down at £16,500! All 66 of the larger than life Wallace, Gromit and Feathers McGraw sculptures sold and fetched an unbelievable total of £1,321,500 on the night! That means that together with contactless donations, the Gromit Unleashed 2 trail app, sculpture raffle, The Greatest Dog Show on Earth 2 exhibition as well as fundraising and private donations, the amazing total now stands at an astonishing £1,621,500.00! Every penny raised at auction and throughout the Gromit Unleashed 2 trail will go toward helping the patients and families cared for Bristol Children’s Hospital and the Neonatal Intensive Care Unit at St Michael’s Hospital. What a summer! I've felt privileged to have been involved in such a great fundraising event. I'm going to be painting a Gromit! So excited to be painting a Gromit sculpture for this year's Gromit Unleashed 2 sculpture trail in my home city of Bristol, UK! The design is top-secret for now, but watch this space for more info :) No doubt the trail will be as successful and exciting as previous trails and should have lots of people flocking to Bristol to see the sculptures. Here comes summer! 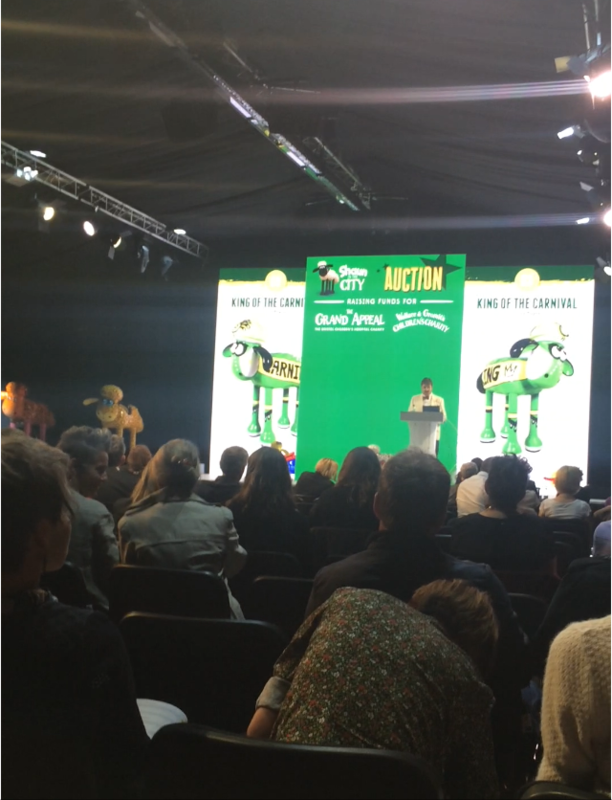 Pleased to say that nearly £20,000 was raised for charity when the Henson pigs went up for auction on 25 September at Highnam Court, Gloucester. Proceeds will be split between the Pied Piper Appeal, Gloucestershire Arthritis Trust and Theatre Gloucestershire. After several weekends of painting, PIG-e is finished and ready to hit the streets of Gloucester for this year's Henson Pig Trail. He will be spending his summer in King Square. Can't wait to see him out there on his grassy plinth! Marketing Gloucester are proud to announce The Royal Three Counties Show as the headline sponsor of an exciting new sculpture trail for Gloucestershire. The Royal Three Counties Show Gloucestershire Old Spots Trail Starring ‘Henson Pig’ will be taking place from June to August 2017. Expanding on the success of last year’s Scrumpty Trail, there will be twenty sculptures in the city with an additional twenty around the county. The partnership with the Royal Three Counties Show coincides with Gloucestershire assuming hosting duties for the event on 16 -18 June 2017 at the Showground in Malvern. In 2017, the long-established agricultural event will be celebrating all that is great about Gloucestershire.The Royal Three Counties Show Gloucestershire Old Spots Trail Starring ‘Henson Pig’ will also highlight to other ancient livestock breeds synonymous with Gloucestershire, the Gloucester Cattle and the Cotswold Lion sheep. The Gloucestershire Old Spots was the first pig to ever be given pedigree status. Known as the ‘orchard pig’, the Gloucestershire Old Spots originates from the Severn Valley pig’ where they foraged on wind fallen apples and whey – bi-products of two of the county’s most famous exports, cider and cheese. It was championed along with other rare breeds, by Joe Henson MBE, at Cotswold Farm Park when it opened in 1971. His son, Adam, took over the running of the park in 1999 and is a presenter on the BBC’s Countryfile. It is in Joe and Adam’s honour that the pig is named ‘Henson’. Just taken delivery of my new greetings cards in time for the art trail this weekend. 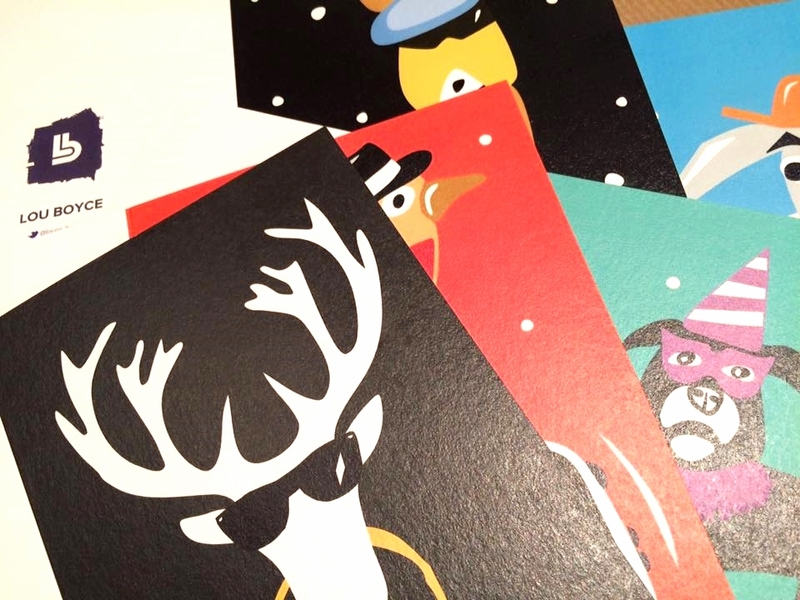 Here is a glimpse of them ... there are 28 designs in all (mainly Xmas, but birthday and baby cards too). Over the moon with how they turned out. Please visit the www.frontroom.org.uk for info on the trail which runs from Sat (12 - 6 pm to Sun (12 - 6 pm). Hope to see you there! Bling bling - it's Xmas tote time! My two latest designs are now available to buy at my Not on the High Street storefront. Really pleased with the muted gold on black - must do some more like this. Hey you - move out the way! Just finished designing a t-shirt for a Bristol organisation called Call of the Brave who make crowdfunded designs printed on sweatshop free tshirts. Pre-orders are now being taken (closing date 31 October 2016) and they need 10 orders before the design can be printed. Spread the word ... this Sunday 11 September in Redcatch Park, Knowle, Bristol. Music, art, stalls and sunshine ... see you there ... my stall (prints, cards and bags) is going to be near the main stage. Just designed a new print for Bristol's Co-Lab/PAPER Arts 'Tropical Paradise' summer art exhibition which runs throughout the month of June. Now available to buy on my Not on the High Street storefront in both A4 and A3 sizes. My cocktail designs are now available to buy as greetings cards on my Not on the High Street storefront! You can buy them individually or as a set of eight. Finally have everything prepared and set up for this weekend's art trail. I'll be displaying, along with 3 other artists, and will be selling limited edition prints, giclee prints, funky Xmas cards and some scaled down versions of my cocktail prints .... also in cards. Our great hosts for the weekend are the lovely Matt and Celilia Cand :) Matt will be spinning some vinyl throughout the day and later on, when it gets dark, he'll be doing some outside photo projections. All this will be happening today and tomorrow from 12 noon to 6 pm. This year I'll be displaying at 1 Stevens Crescent, Totterdown, along with some other artists. The Front Room Arts Trail regularly attracts around 180 artists including dancers, musicians, singers, crafts people, fine artists, dramatists and even exciting local pop-up chefs. 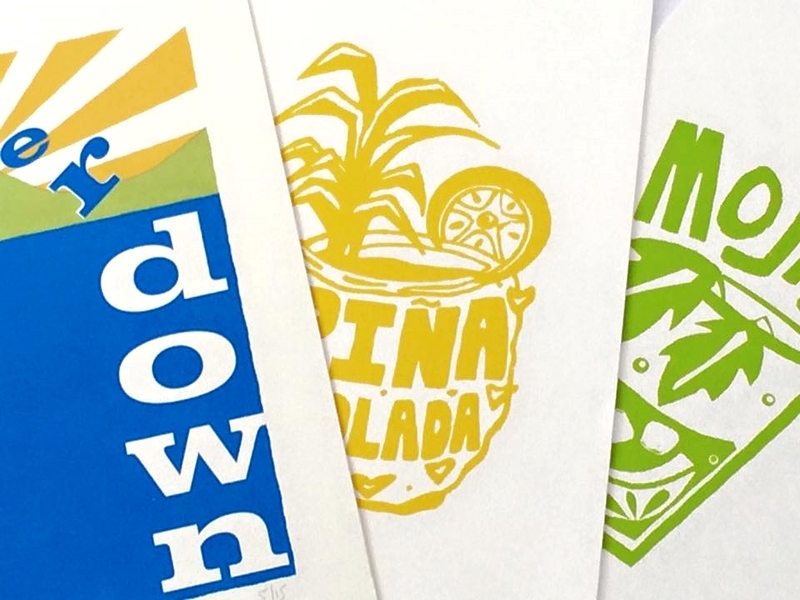 This all takes place in 60 different Front Rooms, street corners open spaces, pubs, cafes, church halls, cemeteries and shops across Totterdown. Well, all I can say is what an amazing, nail biting finish to what has been such an exciting few months. 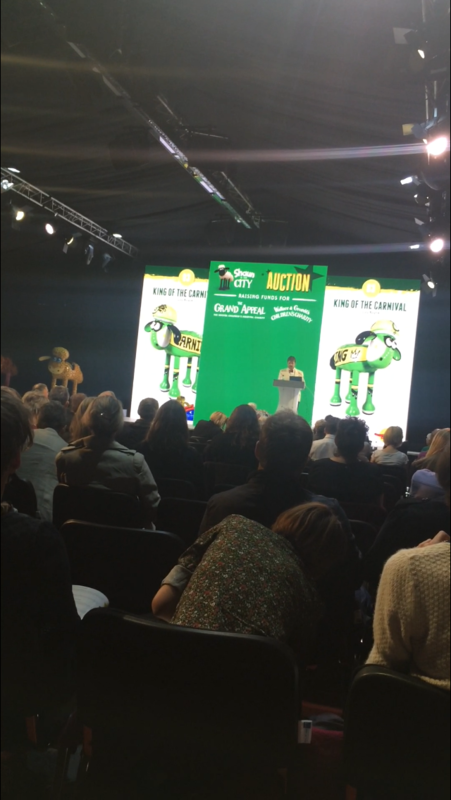 Last night's Shaun in the City auction raised over one million pounds for charity. Every single one of the Shauns sold and King of the Carnival was bought by an online bidder for £4,600! 3 days to go until the auction! It doesn't seem that long ago that I sent in my proposed designs to Shaun in the City and now the auction is just around the corner! Here is an extract from the auction catalogue - I really hope he sells and makes lots of money for the Grand Appeal Children's Charity. From 12 to 20 September, The Mall Cribbs Causeway played host to a truly baa-rilliant sight: all 120 Shaun in the City sculptures united in one giant flock! Every fab-ewe-lous design from both the London and Bristol trails was displayed in ewe-nique categories, including Bristol Breeds, showcasing b-ewe-tiful Bristol designs and Farmer's Market, featuring our Shauns that looked good enough to eat! Thank ewe to all our visitors for supporting the Exhibition and a special thank you to The Mall at Cribbs Causeway, Icescape and Stage Electrics for their fantastic sponsorship of the event. A second Great Sheep Round up Exhibition took place in London from 24 to 27 September. 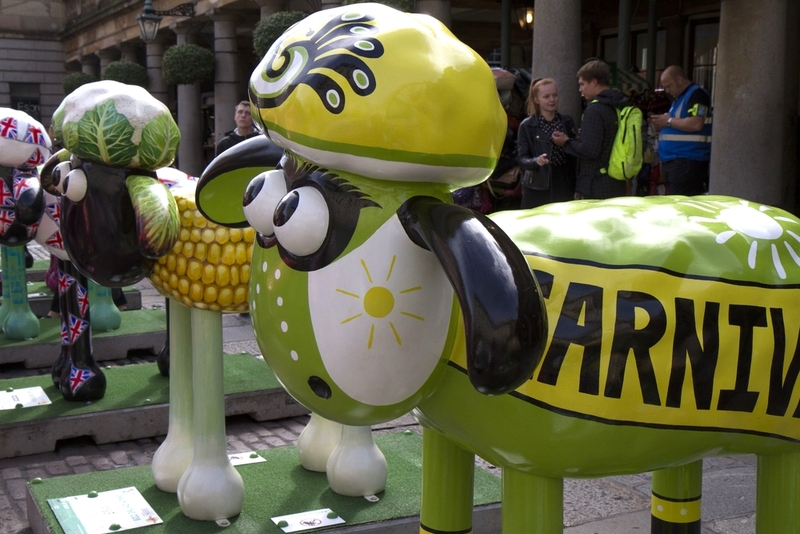 All 120 Shaun sculptures flocked to Covent Garden Piazza to help raise funds for Wallace & Gromit's Children's Charity, and we hosted a baa-rilliant pop-up shop featuring lots of Shaun in the City goodies. What a spectac-ewe-lar sight!